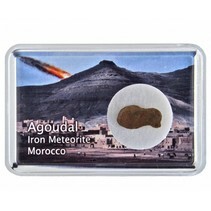 The Agoudal meteorite (Imilchil) is an iron meteorite from Morocco. This huge meteorite impact is a class IIAB with low nickel content. A rarity in the iron meteorites. The Agoudal meteorite is an iron meteorite with a low nickel content and is classified as a IIAB meteorite. This is a fairly rare class within the iron meteorites. Although the meteorite has already begun thousands of years ago lasted until 2011 until it was recognized as such has received its official name. Before that this meteorite was named "Imilchil" to the place where the first pieces have been found in Morocco. Until today, there is still uncertainty about the exact location of the impact craters. What is certain is that it was a massive meteorite impact. These pieces are at high altitude in the Atlas Mountains found near the town of Agoudal.